The Edmonton Arts Council (EAC) in partnership with the Edmonton Heritage Council (EHC), and Arts Habitat has completed Connections and Exchanges: A 10-year Plan to transform Arts and Heritage in Edmonton and presented it to council for consideration. We are proud of the hard work and dedication that has gone into this plan and also for the involvement of many residents. Over the past year Edmontonians were invited to participate in consultations and engagement sessions, both in person and online, with the intention to capture not only as many voices as possible from within the arts and heritage sector but also the public at large. Over 8,800 Edmontonians shared their vision and thoughts for the future of our arts and heritage. Opportunities for involvement included more than 30 in-person events across the City, an online map to share arts and heritage memories, a City of Edmonton Insight Community Survey, and specific sessions with Indigenous artists, Elders, and youth. This important collaborative plan intends to infuse culture, heritage, and the arts into every aspect of Edmonton’s civic fabric, support culture makers, and grow Edmontonians’ connection and participation in heritage and the arts. Culture and the arts have long been associated with economy, health and wellbeing, society and education. 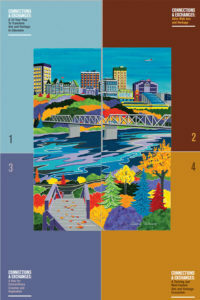 Connections and Exchanges: A 10-Year Plan to Transform Arts and Heritage in Edmonton is the roadmap for arts and heritage for the City of Edmonton. This plan will guide and strengthen the City of Edmonton’s ongoing development, support, planning, and investment in the arts and heritage sectors. The primary goal of this plan is to ensure arts and heritage are a core component of everything the city does — the arts are integral to the civic identity of Edmonton— and that arts and heritage are accessible and a part of every Edmontonian’s everyday life. We encourage you to click here to read through it.